The ACT Center conducts testing and provides consultation services in order to help determine whether your website content or product is accessible to people with disabilities. By using automatic and manual testing and consultation services, we provide you with the tools, strategies, and knowledge needed for you to make your content accessible to the widest possible audience. It is important to understand that creating an accessible website is a gradual process and that evaluations may need to be performed on a continual basis. Throughout campus, we strive to be welcoming and inclusive. In an effort to improve our digital campus, it is important to consider accessibility during web development. There are several ways to accomplish this depending on your skill and comfort level. 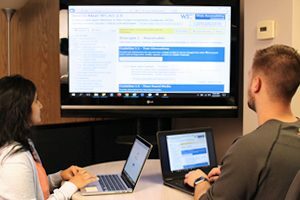 The ACT center has a list of free and easy to use accessibility tools to test your website for accessibility issues. These tools can check for compliance issues found in Section 508 and WCAG 2.0 guidelines. Is important to note that automated tools cannot check for all the accessibility guidelines and some manual testing is required to determine full compliance. We also perform manual and automated testing against the Section 508 and WCAG 2.0 guidelines for you. We use screen readers, such as JAWS for Windows and VoiceOver for Mac, to simulate what your site would be like for people who are blind or have severe visual impairments. We also perform various tests to evaluate the website from the perspective of other disabilities such as hearing loss, manual dexterity, color blindness, low vision, etc. We will provide you with a comprehensive report of all our testing results. While purchasing products or services for the university, you have the responsibility to ensure that IT products are accessible to persons with disabilities. To learn more see Procuring Accessible IT. Anyone who has a website on the MU campus whether student, faculty, or department, is welcome to take advantage of this service. To request a comprehensive web accessibility audit of your website or web app, or for web accessibility training, complete the Web Accessibility Services request form. If you have additional questions, call the ACT Center at 573.884.2828.